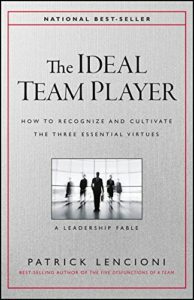 Book Review: The Ideal Team Player by Patrick Lencioni : Executive Leader Coach @ dbkAssociates, Inc. In his usual engaging style, Patrick Lencioni has expanded on his previous book, The Five Dysfunctions of a Team, to show us how to make sure we find the ideal team player for our next hire. Through a parable he shows us how to recognize and cultivate the three essential virtues named as humble, hungry and smart. In Lencioni’s story, the challenge becomes “honing” a company’s culture to be one of a high functioning team, with everyone pulling together. I’ll not spoil the story for you, but instead suggest that there was a lot of consternation over what attributes an ideal team player possessed. The leadership team did what you would do—thought about the folks that they all agreed were good team players and also were performers. They listed the people and figured out, as best they could, what attributes they could identify as being pertinent to team players. According to the author, “Hungry people are always looking for more. More things to do. More to learn. More responsibility to take on. 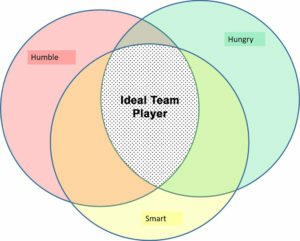 Hungry people almost never have to be pushed by a manager to work harder because they are self-motivated and diligent.” To my way of thinking, this more or less adds up to what Daniel Pink calls “Mastery.” Given that an employee is engaged, (Autonomy, Mastery and Purpose), then I believe that they will exhibit all the characteristics of a hungry player. I am not fond of this label. Lencioni struggled a bit too, according to my reading. This means “people smart.” High emotional intelligence. So of the three virtues, this one needs the most clarification because it is not what it might seem; it is not about intellectual capacity. Nor is it a measure of technical competency. In the context of a team, smart simply refers to a person’s common sense about people. And like many values, virtues and attributes, this common sense about people is the most difficult to discern during the hiring process. The bottom line on this book is that Lencioni has once again put a fabulous business parable together. It is fun to read, very insightful and is amazingly short considering its impact. While I hope I’ve given you the salient points, I hope you read the book and enjoy the story—there’s much more fun than I’ve revealed here!